The perfect butternut squash is dense, sweet and versatile enough to feature in every meal of the day. A squash that's been picked too soon or is past its prime, however, will be dried out or mushy and flavorless. Rather than risk ruining your meal with a bad butternut squash, consider all your options at the market; if you're willing to take the time, it's easy to find the best of the bunch. Your grocery store may carry butternut squash year-round, but its peak season is summer through late fall. The squash is technically a fruit because it contains seeds, and its flesh and rind are both shades of yellow and orange when ripe. This color is an indication of the carotenoids, or nutrients that protect you against heart disease, that the flesh contains. Butternut squash is also low in calories, nearly fat-free and packed with fiber, folate, potassium, vitamin C and vitamin B-6. Your squash won't ripen much after it's been picked, so choose one that is ready to eat. Pick a squash that feels hard and heavy. Avoid any squash with shiny skin, which indicates it was picked too early, or those with any green patches on their rinds. The entire squash should be a dull orange color, though minor blemishes aren't a problem as long as there's no sign that anything has pierced the flesh. Pick a squash with an intact stem; the stem will keep the squash from drying out too quickly. Once it's cut, you can wrap butternut squash in plastic wrap or store it in an airtight container and it will stay good for up to a week in the refrigerator. If you don't cut into it, it will last for as long as three months in a cool, dark place; don't store it in the fridge. It will stay edible until the skin starts to get soft and develops spots. 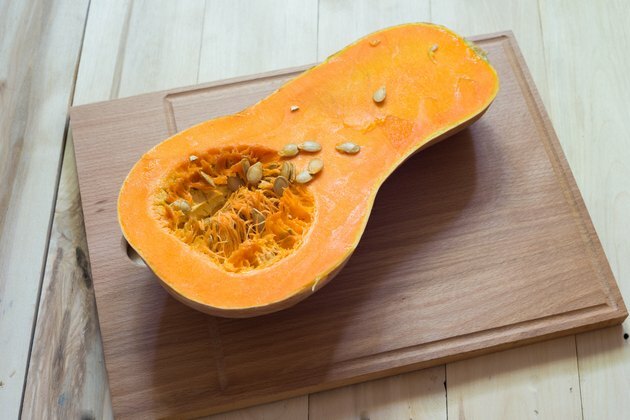 To prepare the squash for cooking, use a vegetable peeler or sharp knife to slice off the rind. Cut the squash in half and scoop out the seeds, then get cooking. You can saute, boil, steam or grill butternut squash, and baking is a particularly easy way to prepare squash for nearly any recipe. For a basic preparation, cut the flesh into chunks and toss them with olive oil. Spread the pieces out in a baking dish and bake in an oven heated to 400 F for about 30 minutes, or until the pieces are soft. Sprinkle the chunks with salt and fresh, chopped herbs, mash them to make a roasted alternative to mashed potatoes, or puree them in a blender and use them in a pie or pudding recipe or to make the filling for ravioli.